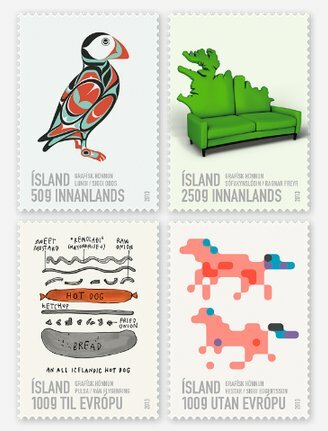 The fourth stamp series on contemporary Icelandic design is dedicated to graphic design. The motifs are the work of four young graphic artists. Sigurdur Oddsson was born in 1985 and grew up mostly in Vancouver, Canada. There he became acquainted with native Indian art which influences his imagery. He graduated from the Iceland Academy of the Arts in 2008. He has worked for the art, fashion and music industry. Ragnar Freyr Pálsson was born in 1980. He graduated from the Iceland Academy of the Arts in 2005 and went to study at the Iceland University of Education. Ragnar founded his workshop in Reykjavik 2001. In his art and design Ragnar emphasizes simplicity and minimalism. Rán Flygenring was born in Oslo 1987 and grew up in Reykjavík. She graduated as a graphic designer in 2013. She was the Court Designer of the City of Reykjavík in 2011 and won the German Children Book award for the book ”Frerk, du Zwerg”. Sigurdur Eggertsson was born in Akureyri 1984. He studied graphic design at the Iceland Academy of the Arts. He studied at the Weißensee Academy of Arts in Berlin and completed his studies in Iceland. He lives in Berlin and works for clients around the world.